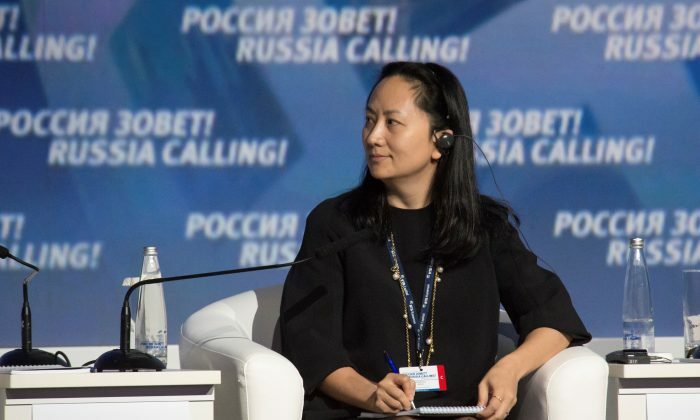 VANCOUVER/BEIJING—The daughter of Huawei’s founder, a top executive at the Chinese technology giant, was arrested in Canada and faces extradition to the United States, roiling global stock markets as it threatened to inflame Sino-U.S. trade tensions afresh. The shock arrest of Meng Wanzhou, 46, who is Huawei Technologies Co Ltd’s chief financial officer, could have repercussions for the 90-day truce on trade struck between U.S. President Donald Trump and Chinese leader Xi Jinping on Dec. 1—the day she was detained. Huawei is not listed, but China’s second-largest telecom equipment maker, ZTE Corp, sank nearly 6 percent in Hong Kong while most of the nearby national bourses lost at least 2 percent. MSCI’s benchmark for global stocks declined 0.61 percent, and U.S. markets were on track to open lower by 1 percent or more. Investors stampeded for the safety of government debt, pushing the yield on the U.S. 10-year Treasury note back below 2.9 percent to its lowest level in three months. Huawei is already under intense scrutiny from U.S. and other western governments about its ties to the Chinese regime, driven by concerns it could be used by the state for spying. It has been locked out of the United States and some other markets for telecom gear. Chinese foreign ministry spokesman Geng Shuang told a daily briefing on Thursday that China had asked Canada and the United States for an explanation of Meng’s arrest. The Chinese consulate in Vancouver has been providing her assistance, he added, declining further comment. On Wednesday, China’s embassy in Canada said it opposed the arrest and called for her immediate release.